Molecular markers allow a detection of cryptic variation and can shed a light on the long term history of species, as well as on the radiation among closely related species. With a phylogeographic study of the stag beetle Lucanus cervus (L, 1758) we want to elucidate the colonisation history and timing of this species from putative southern refugia after the last ice-age. Furthermore, the study will allow us to delineate evolutionary significant units, helping to evaluate the current taxonomic status of the stag beetle and detect hidden variation. If cryptic variation is detected, we plan to analyse whether this variation is associated with morphological differences. 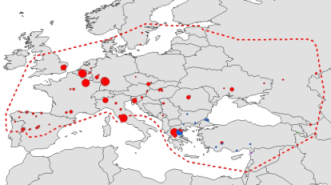 The current geographic distribution of genetic lineages (haplotypes) will be used to infer colonisation patterns and can help to outline a protection strategy based on the genetic variation of the species. The knowledge on historical colonisation processes can help us to better understand the limitations in the colonisation capacity of this species and to formulate protection measures on a landscape scale. Possibly, the division between major phylogroups can be dated and compared with other data from colonisation patterns of tree species. Given the saproxylic nature of the beetles we can expect to find some associations. Currently we have collected over 200 samples from more than 60 localities of L. cervus from all over its distribution area. These samples include the subspecies/forms akbesianus, turcicus and judaicus. We are currently still looking for samples from the eastern part of its distribution including Poland, Belorussia, Turkey, Syria, Lebanon, Israel, Georgia and Azerbeidzjan. If you can provide us with beetles from one of these area’s please let us know. For more info contact Arno.Thomaes@inbo.be. We like to acknowledge all the people who already helped us with samples.